Located at the tip of Cape Yamu and overlooking the turquoise Andaman Sea and the dramatic limestone pillars of Phang Nga Bay, here at Seven Skies we were lucky enough to road test this freshly minted resort from top to bottom over seven days. 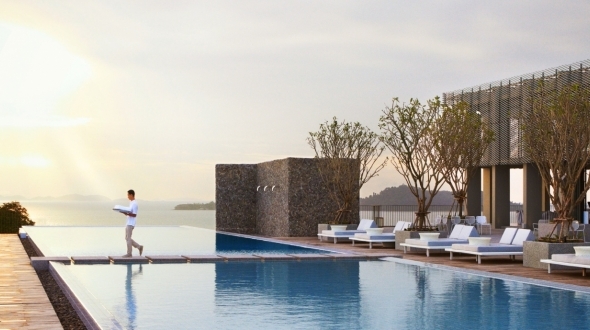 Situated on the east coast of Phuket, Point Yamu by COMO offers a fresh take on holidaying here. Forget about the brash and busy west coast, here the experience is all about soaking up the quite simply astonishing views and the tranquillity of this gem of a marine park. Perched high on the tip of Cape Yamu, there are views everywhere of this undeveloped pearl of coastline – from the limestone islands that are dotted around the bay to the never-ending blue of Phang Nga Bay. We never stopped marvelling at the view no matter how many times we saw it. Then there is the pool, and all 100 metres of it. Running the length of the resort, with varying depths, pop a chair in the pool and read a book at one end or swim laps at the other end cantilevered over the gardens below. The design is a sensation around every corner. Forget about wood, here Italian designer Paola Navone delivers a contemporary expression of Thai luxury in both the public spaces and rooms, from whimsical laughing Buddha’s that adorn the hallways to your rooms, to the floor to ceiling aqua tiles in the bathrooms, to the very beautiful La Sirena restaurant and the supremely comfortable bean-bag style outdoor daybeds – enjoying the design here is as much a part of what makes for such a wonderful experience. Then there is the food. What can often be a let-down in many a fine establishment, in true COMO style the food here is simply outstanding. We think breakfast is one of the hallmarks that takes a hotel from great to amazing, and this was without doubt the best breakfast experience we have ever enjoyed – think freshly husked coconuts, divine pastries, an al a carte menu with such delights as coconut waffles, and a wonderful array of healthy alternatives and cold pressed juices. Add to that an outstanding Thai restaurant with a proud Phuket born and bred chef – we loved the blue crab curry and the Thai-style ocean trout soufflé – and excellent Italian on offer at La Sirena, and you would be well justified coming here for the food alone. With 79 rooms and suites, including some with private pools, and villas nearing completion, we liked the Verandah Pool Suites for the never-ending Phang Nga Bay views. The warm and personal Thai service under the stewardship of the ever present GM, James Low, and the famous Como Shambhala Spa, completes the experience here. We’ve fully experienced everything this resort has to offer, from the best rooms to the not to miss experiences, so contact us about organising your stay. Goes well with? Our Bhutan experience – with most of our guests transiting through Bangkok, let us add this on as your after-Bhutan beach break.